Bears on the Chain (Chain of Lakes), is like the Cows in Chicago. 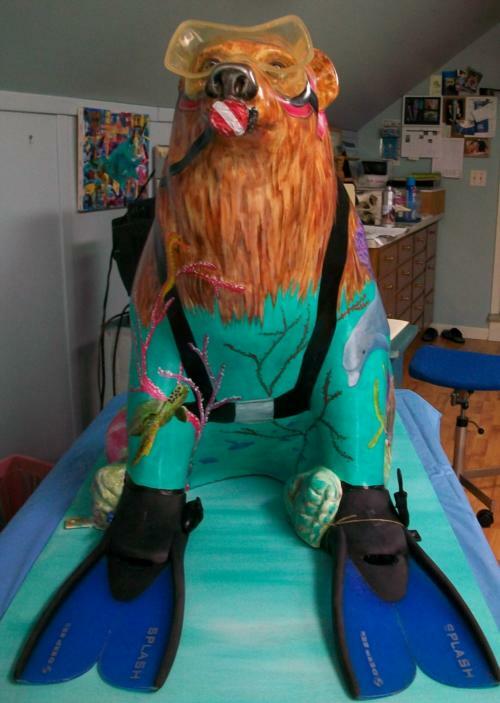 I participated, having to submit a design and paint a bare bear sculpture, 28" high x22" wide. One of the local businesses had to sponsor my bear, which is Great Lakes Credit Union. The bears will be show in local establishments and then in Sept, be auctioned off and the proceeds going to local high school , Open Pantry and Save-a-Pet. If you read my personal blog, http://www.bonnielynnsart-bonnielynn.blogspot.com/v, you will see the progression I made of the bear from start to finish last night. Welcome to the "food chain"